Fast-growing biotechnology company Assurex Health will make a $15 million commitment to Mason as the company builds its new headquarters and laboratories in the city. The Mason-based personalized medicine company will occupy a 30-acre site on Innovation Way, which is located near the Western Row Road exit off Interstate 71, company officials said Thursday. The tenant advisory group of DTZ will manage the facility’s design and development. While Assurex Health’s building is expected to be 60,000 square feet initially, designs will also include plans for a 30,000-square-foot addition. The new building could be completed by the fourth quarter of 2016, said Don Wright, the company’s chief operating officer. The new headquarters is the iteration of a long-range growth plan the company, said Wright, who was also the company’s first employee. Assurex Health was spun out of Cincinnati Children’s Hospital Medical Center in 2006 and its humble beginnings include operating out of an old garage near Kings Island. But in the past three years, Assurex Health has tripled its employment to nearly 300. In the same time frame, the number of patients that have received its GeneSight tests has quadrupled to nearly 150,000. Assurex Health is the latest company that has been lured to locate in the city’s Oak Park District, which is about 250 acres of land located at Interstate 71 and Western Row Road. City officials are working on a master plan for the area and they expect it to be a hub for retaining young talent and hosting bioscience and advanced manufacturing jobs. Employers such as Assurex Health will make their home in the district, but it is also envisioned as being a walkable area that features restaurants, open creative spaces and retail. Wright said the site offers great access to its regional science partners and talent. He said Assurex Health is excited about bringing its “culture of wellness and creativity” to help the city fulfill its aspirations for the Oak Park District. Assurex Health’s proprietary technology is based on pharmacogenomics, which is the study of the genetic factors that influence an individual’s response to drug treatments, as well as evidence-based medicine and clinical pharmacology. 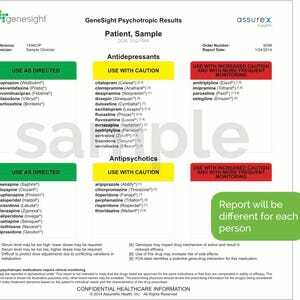 Its GeneSight test helps health-care providers make more precise treatment decisions based on a person’s response to 38 U.S. Food and Drug Administration-approved medications for depression, anxiety, post-traumatic stress disorder, bipolar disorder, schizophrenia and other mental health conditions. Typically, reports are available 36 hours after the company gets a patient’s cheek swab. GeneSight is based on technology licensed from Cincinnati Children’s and the Mayo Clinic.